Elements EP No.4 in the UK SOUL CHART!!! 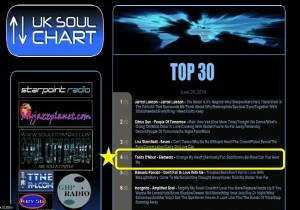 After 5 Weeks in the UK Soul Chart Tasita’s EP and the Change My Heart Remixes hit the top spot of Number 4 in the chart, an achievement we are all proud of. A big Thanks to Starpoint Radio and Kevin J for their of Tasita’s music, we are all chuffed in the Tasita Camp.